From the moment of purchase it is essential to start thinking about boat maintenance and the schedule of upkeep if the vessel is stay looking new and performing well. 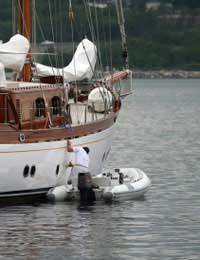 Firstly it is important to personally inspect the boat or hire a professional boat inspector. Local boat traders may have their own inspectors available for hire. If the boat is second hand then a boat survey should have been carried out on the buyer’s behalf at the point of purchase. This is where the boat is surveyed by a qualified marine surveyor to assess the status of the vessel. Comments and recommendations from either inspection will be useful in determining what aspects to watch out for and what are the maintenance weaknesses of the boat. In order to keep a boat efficient and looking good it needs a regular wash down around one or twice a week, particularly when it is taken out into saltwater. This is in order to maintain the boat’s finish for as long as possible, as a lot of damage can be done to a boat from not just salt, but dirt, the sun and acid rain. Feet on the decks attract a lot of grime that runs down the side of the boat when it rains and leaves streaks across the hull. It is recommended to wash the outside of the vessel with a mild detergent as strong cleaners remove the layer wax, and leave the finish vulnerable to dirt and harmful sun rays. Marine stores sell detergents especially made for boat finishes. Also as boats are usually made from a variety of different materials such as fibreglass, metal and canvas, it is important to take notice of which cleaning substances are used for which material. The boat wax is important because it is what maintains the value and eye-catching glossy look of the vessel during its life time. It is not necessary to wax every time a boat is washed but it is advisable at the very minimum to wax it in the spring before its season of service and then again in the autumn before it is stored away for the winter. There are numerous different types of special boat wax available and it is recommended that boat owners apply a double layer of paste wax to their vessel, and they are also wise to use natural instead of chemical products in order to help preserve the finish of the boat. Interior boat detailing is not simply a case of vacuum cleaning the living quarters every weekend, it involves a careful and extensive procedure of cleaning that will dramatically improve the look of the boat in the long term. As well as vacuuming, aspects that need to be considered when detailing include polishing different materials such as wood or metal, cleaning windows and blinds and steam-cleaning carpets, canvas and upholstery. Although such attention to detail may seem excessive to some it can prevent bacteria and termite problems that deteriorate the quality and value of the boat. It is easy to overlook the maintenance of the part of the vessel that is underwater because it is out of eyeshot, but this is the most important aspect. This is because barnacles, algae and other marine life attach themselves to a boat’s bottom and affect its speed and performance. For this reason the bottom of a boat should be regularly inspected and cleaned. Many boating enthusiasts even claim that a regular bottom cleaning saves them on fuel. Boat maintenance is not just confined to cleanliness but also making sure that everything mechanical runs efficiently. This process includes checking the oil level of the engine, as well as the A.C. power generator and checking all the batteries on board. Also it is important to check that all the navigation lights are working as well as any other navigation electronics. Boating is certainly an enjoyable way to spend an afternoon or a weekend but it is also very tiring and cleaning the vessel is probably the last thing anybody wants to do when they get back home. But it is worth bearing in mind that keeping a boat in good condition will not only maintain its performance and good looks but it will also its resale value.